In my post earlier today I mentioned that I would like to do a scrapbook for each student. I also said that it seemed like a lot of work to make that many pages and that I might make digital pages, print them, and just add a picture and handprint to them. I've made a page for August & I thought I would share it. Let me know if you like it. If so I will continue to post them. 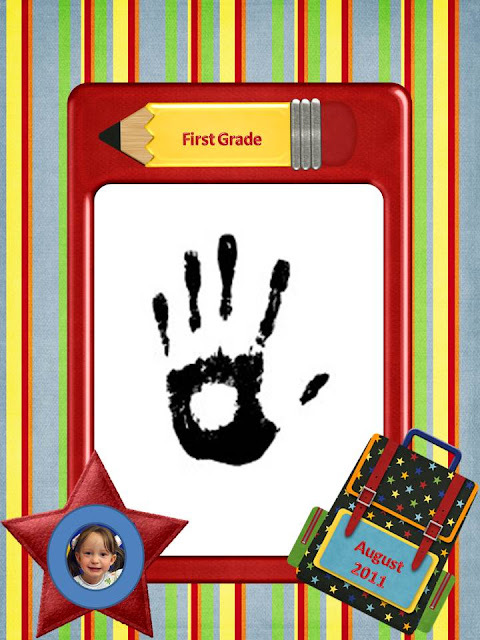 This example includes the handprint and a picture of my precious little one, but the downloadable one does not. Just click the picture to get the blank version. Very Cute. What do you use for digital scrapbooking? I got my post up about my memory book. It was so time consuming the way I did it. If I had a good program with great themes and extras it would be easier. Mixbook is very cute but you can's save the pages as a .jpg - bummer. Thanks. I use Power Point to do my designing in & I just use digital clipart. The set I used for this page are from Just So Scrappy Too.